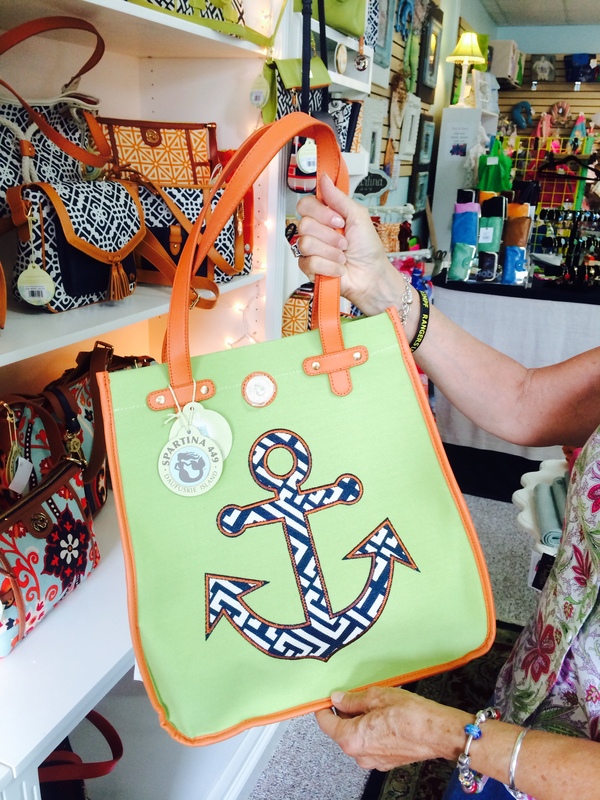 The Crystal Coast Blog » Your Bags are Packed Including Your Beach Bag. What’s in Yours? Most of you have a much shorter distance to travel. But we all have one thing in common. Everyone will pack a beach bag. What should be in yours? Before We Go There – It’s All About Style! Beyond stylish, your beach bag must be rugged. The material of choice is typically canvas, or maybe sailcloth. Nautical patterns are popular as are bright colors. Walk the beach and you’ll see the usual brands… Spartina 449 of Daufuski Island (see photo), Lands End, LL Bean, Lily P. Lots of L’s there. We all know the painful effects of the sun. Sunburns are terrible. Especially for the little ones. Slather up with sunscreen. The higher the SPF the better. This includes your lips, ears, ankles, feet and everything in between. Sunglasses are mandatory for a day outside. Beyond the rays, elements like wind, and sand are a nuisance. We don’t go anywhere without our phones. This certainly true for the beach. Protect it from the elements. If you can’t afford a LifeProof jacket for your phone, a water resistant phone pouch is a must! Everyone loves an over-sized, thick, colorful beach towel. Stylin’ on the beach is a must. What you bring to the Emerald Isle beach should say a little about your personality. Just try trekking across the sand barefooted. Ouch, your feet will get fried! Flip flops or some type of Keen sandals are a must. It’s all about comfort, protection and style. Find the perfect pair to show your summer style. A Great Read and a Lot of Gossip! Beyond your music on your phone or iPod, a great book and the beach go hand in hand. Kindle or a traditional paperback will help you loose yourself. Look inside any beach tote and you’ll find a pile of magazines. The ladies love their gossip mags. The guys are mostly about fitness and sports publications. Beyond the obvious heath essentials above, the #1 item in your beach bag should be H2O. Staying properly hydrated is a must when out in the sun. Want your liquid refreshment to stay cold? 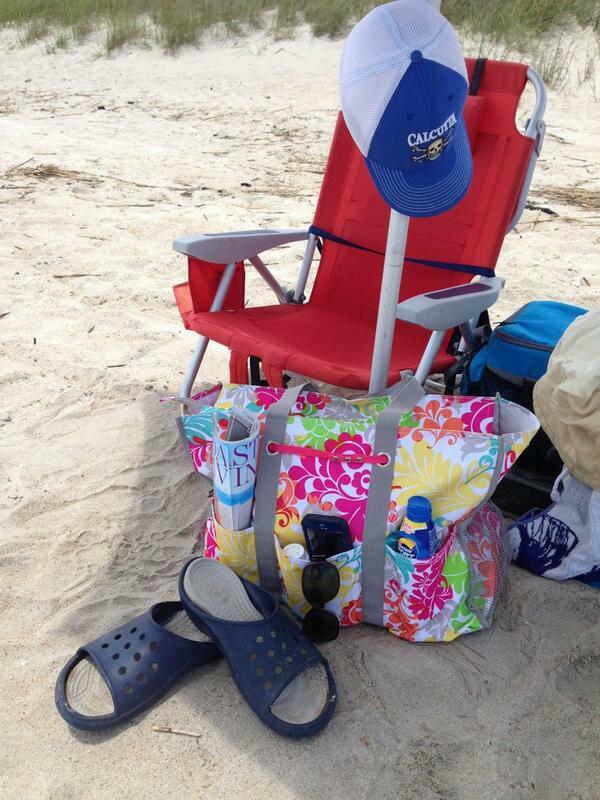 Be sure to toss a koozie in your beach bag too! I’m in total agreement when it comes to the chocolate! Leave a comment and tell us what’s in your beach bag! we are those people from NE Ohio who drive to EI every year! We have noticed all the Ohio license plates, too! Some of the items in my beach bag have changed from our first trip to EI 18 years ago. Back then our youngest was 4! Now, as nearly senior citizens, we make sure that we carry Ibuprofen and burn gel as precautionary measures for our sun worshipping kids and grandkids. We also put up a cabana, which never happened in the past, to sit under. The important thing is we still drive in from OHIO and wouldn’t miss it for the world! Thanks for the comment Rebecca and thanks for reading our blog too. We love visitors from the Buckeye state! As we are “boomers” with grandkids in tow too, what we bring to the beach has changed as well over the years! Lugging a “cabana” to the shore is mandatory now. It provides us an oasis from the sun and makes for a great place for the grandkids to play too. Just curious, what topics would you like for us to post about?